So, I am not sure what happened with my post yesterday, but here is the real one coming at you today! 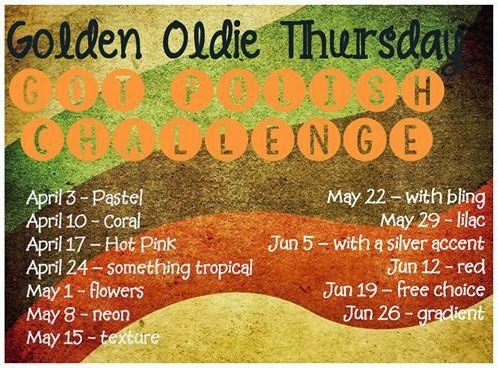 This weeks challenge was to use your oldest lilac color. As you know, I am not a huge pastel fan, so my selection was pretty limited. I bought 1 pastel of each color last spring when pastel was THE thing to do. I did a couple springish designs and a couple pastel themed deigns and then back into storage they went.I just don't like how pastel looks. Maybe it's because I have never seen a holo pastel or a jelly pastel or anything fun. It's just straight chalky color. I do not like!! Anyway, for this weeks challenge, I chose to use an oldie but goodie!! Haha get it! Anyway, I am using Candy Coated by Sinful Colors. I know, I know it's not that old. It is however at least a year old. It is from the Sugar Rush Collection from Spring 2013. I made it, just within a year. Candy Coated is used with 2 coats in these pictures. You know my deal with 2 coats. In case you don't, I always HAVE TO HAVE 2 coats. Even if it is opaque in 1. This does require 2 coats just to fill in the patchy areas. The color is a kind of lilac leaning a little blue and it has a tiny bit of shimmer. For me, my shimmer went bye-bye once I added a top coat, but it was there. Anyway, enjoy until next week where I will be doing "WITH A SILVER ACCENT". You can bet this will have some stamping! !